I've been wanting to try Republic Noodle since before it opened because it seemed like my kind of place. And I was not wrong. Our meal there, while not perfect, made me very happy. Because fun, flavorful food, particularly if it's Asian-style, is a very good thing. The small restaurant is quietly decorated and rather zen. We sat at a table by the large front window and from a distance watched the chef - the lone man in the open kitchen - work. Because he was the only one cooking, food came out at a leisurely pace, but that was fine with us as it gave us more time to savor the many dishes we ordered. Somehow it seemed right to order one dish from every menu category even if it meant we'd have a rather large doggie bag at the end. 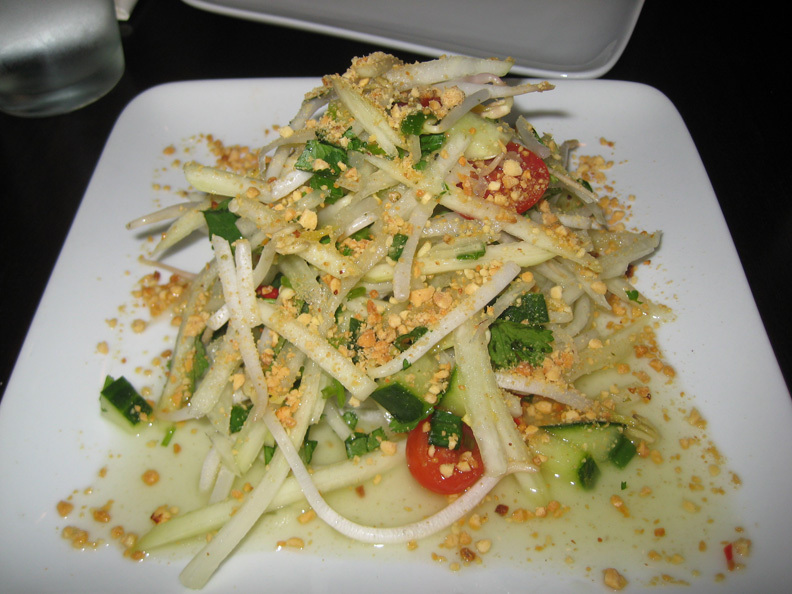 We started off with the green papaya salad, which was tangy, sweet, bright, spicy, and fishy, just as it should be. It was a very good way to start our meal, as the vibrant flavors really woke up the palate. 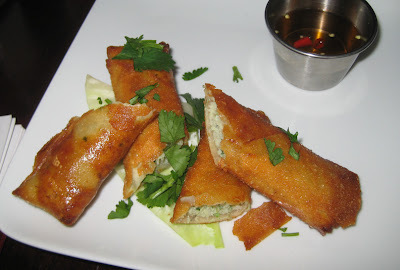 Next up, we got a duo of fried things, the Thai chicken rolls and a small order (6) of the Northern Thai-style wings. The spring rolls were piping hot and grease-free, the crisp wrappers filled with a springy and flavorful ground chicken mixture. 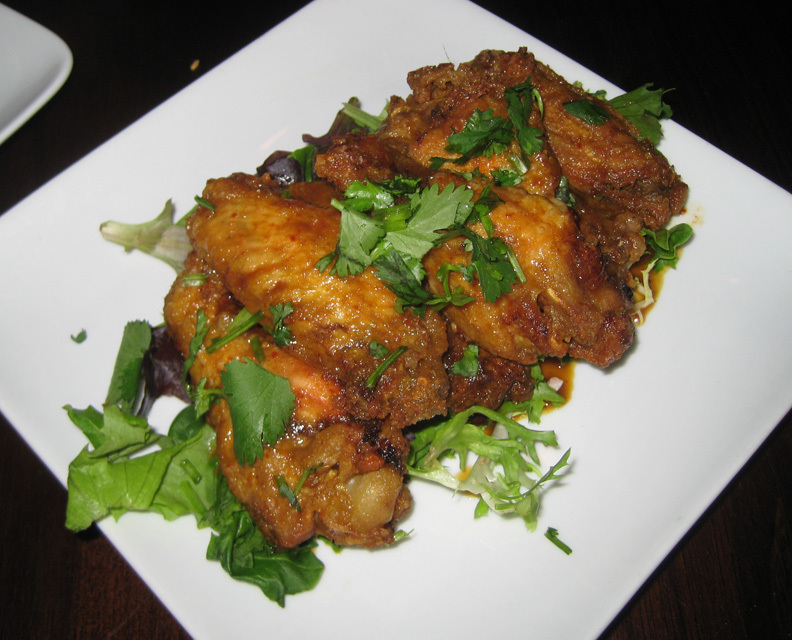 The wings were amazing - fall-off-the-bone tender, extremely juicy, with an intense chicken-y flavor. The spicing was very mild to our palates, especially compared to the papaya salad that left our lips tingling, and it was unusual. And unlike most wings, these didn't make our hands sticky or gloppy. Oddly enough, for a place with "noodle" in the name, the two noodle dishes we ordered were the biggest disappointments. Mr Minx went for the stir fried vermicelli offering topped with chicken. The noodles were bland, the chicken breast was tough and overcooked. A couple of squirts of Sriracha from the bottle that was part of the table decor helped a bit but there was still something missing. 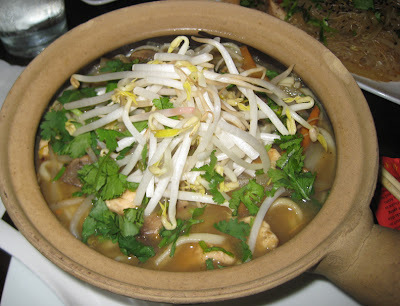 I went for udon noodles in a Khmer coconut curry with more of the same overcooked chicken. 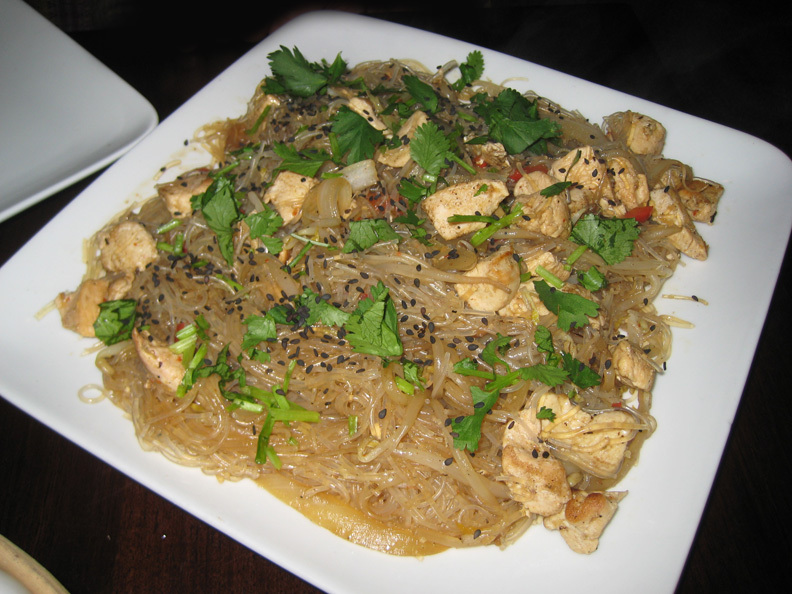 While more flavorful than the vermicelli, it was also a little on the boring side. It needed more heat, more acid, more something, to jazz it up. The udon noodles themselves were good though, somewhat chewy and not too thick. Finally, we ate the Shanghai-style fish & chips with black soy tartar sauce. 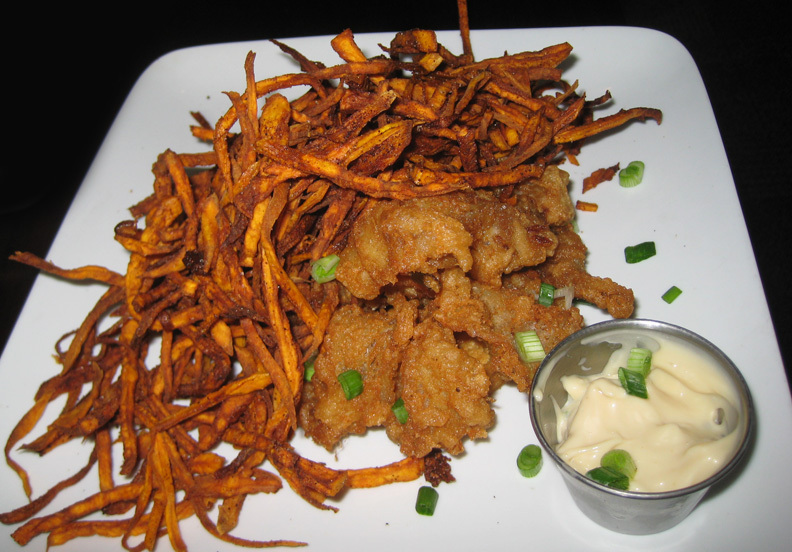 I don't know what exactly made the battered pieces of cod "Shanghai-style," but they were delicious nonetheless. Even better were the chips, actually super crisp shards of sweet potato with a curry-like seasoning that made them positively addicting. Four out of six dishes ain't bad. We'll definitely go back and try more of the hot and cold small plates, and I think it would be fun to go with a group of people and order every one of the seven varieties of wings available. Anyone game? NOTE: Sadly, Republic Noodle closed not long after we visited.